Lucy and Owen meet somewhere between the tenth and eleventh floors of a New York City apartment building, on an elevator rendered useless by a citywide blackout. After they're rescued, they spend a single night together, wandering the darkened streets and marveling at the rare appearance of stars above Manhattan. But once the power is restored, so is reality. Lucy soon moves to Edinburgh with her parents, while Owen heads out west with his father. Lucy and Owen's relationship plays out across the globe as they stay in touch through postcards, occasional e-mails, and -- finally -- a reunion in the city where they first met. A carefully charted map of a long-distance relationship, Jennifer E. Smith's new novel shows that the center of the world isn't necessarily a place. It can be a person, too. I loved loved loved The Statistical Probability of Love at First Sight and This is What Happy Looks Like. So obviously as soon as I found out that this book was going to exist, it was on my TBR. I found this one to be a mix of the previous two stories. Lucy and Owen's meeting was happenstance, like in Statistical Probability, and they kept in touch not through emails like in Happy, but through postcards. It was a cute story, but it didn't completely grab me. 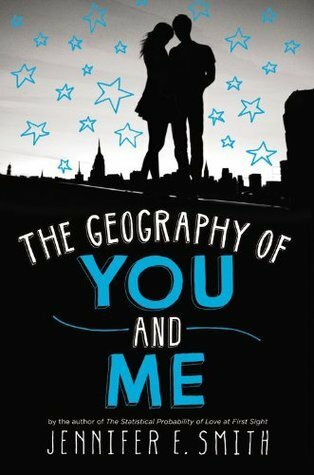 While I liked the concept/theme of the geography and the postcards, the part of the story where it is alternating back and forth between Lucy and Owen AND they are in different parts of the world every time gave me a bit of whiplash. It was just a little too much. It was the little things in this book that I loved. Point Zero. The fact that both their parents were NOT clueless. (I really appreciate that -- it's refreshing when clued in parents appear in YA books because they do, generally speaking, understand what their teen is going through, having been teens themselves before.) I also liked how not everything was perfect all the time. The reality of something (yes, I'm thinking of a particular instance in the story) did not at all turn out like the expectation and and that is a very real possibility. Yet, it also wasn't the end -- which is also very real. And in the end, it was just a part of the story. I love that. So this one was cute, but I'd say definitely read the two books I mention above over this one. Then if you're still up for simple and cute love story, pick this up. This one is on my TBR list, but so are the other two Jennifer Smith books. I guess I will start with those first as you suggest.